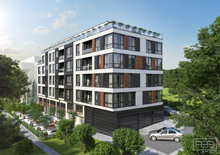 Buy in Bulgaria is presenting newly built complex in the small sea village of Ravda. Ravda has an excellent location and excellent nature – soft, sandy beach, clean air, romantic bays. All this make Ravda a preferred destination for calm summer holidays. Through the architectural design of the complex, preservation of the feeling of harmony, romantics and serenity is achieved. The interior design focuses on the comfort and functionality. The complex is comprised of two interconnected buildings – A and B, within which, spread over five floors, 57 apartments are available. Spacious penthouses occupy the last floor. Lift is available. The apartments are offered fully finished, ready for furnishing.